How many times have you ran out of the house without your keys or dropped them somewhere? Well if you live alone and not in a high rise that could be an issue. Most of the front desk staff in the high rises can hold a spare key on file so you can access it, if you happen to forget your key. Have a pet that needs to be let out but your boss is insisting that you finish these reports? Just call the dog walker and they can get the key to your unit to let your best friend tinkle. Have you ever missed the UPS guy three days in a row? How frustrating!! In every high rise building in Las Vegas you have a concierge or a door man to sign for and receive packages on your behalf. Let me guess, you just scanned your Amazon wish list at the thought of the convenience? Some of the high-rises in town are gated with a handful offering key fob entry systems. Every high-rise has 24 hour security measures in place to offer you the piece of mind you deserve, with cameras to watch the grounds, valet, and or garaged parking. You’ll also have a front desk staff who knows your name and patterns. Is there someone you want to keep out? A crazy ex or two…? Rest assured that no one is getting to your door without talking to security, proving their identity, and making sure they are an invited guest. Whether it’s pulling up to valet, being handed your fresh dry cleaning by the concierge on your way home, or the limo waiting exactly at 8pm to take you wherever your heart desires. You’ll enjoy the luxurious feeling that comes with high-rise living. All high-rises in Las Vegas are full service buildings with a team of staff who go out of their way to accommodate requests, making your life feel effortless. How much do you blow on your gym pass a month? Wait, how long do you spend just getting to the gym? How long do you spend sending texts to fair weather friends with pools just because the weather isn’t so fair? Are you ever stressed for a quick meeting spot and can’t stomach the absurdity of Starbucks again? Every high-rise here in Las Vegas comes equip with killer gym, a resort style pool, and a meeting/work space. The best part? They’re all an elevator ride away. If you’re new to town making friends can seem daunting this city. The high-rise life has you covered once again. You’ll be invited to resident mixers where you can meet other residents, talk, shop, or enjoy hobbies while sipping on some free or deeply discounted cocktails. You’ll feel a part of the building lifestyle during hosted yoga classes by local businesses owners or by getting involved in community service projects that aid the city. A few of the buildings even offer communal breakfasts weekends for residents to indulge in and connect at. 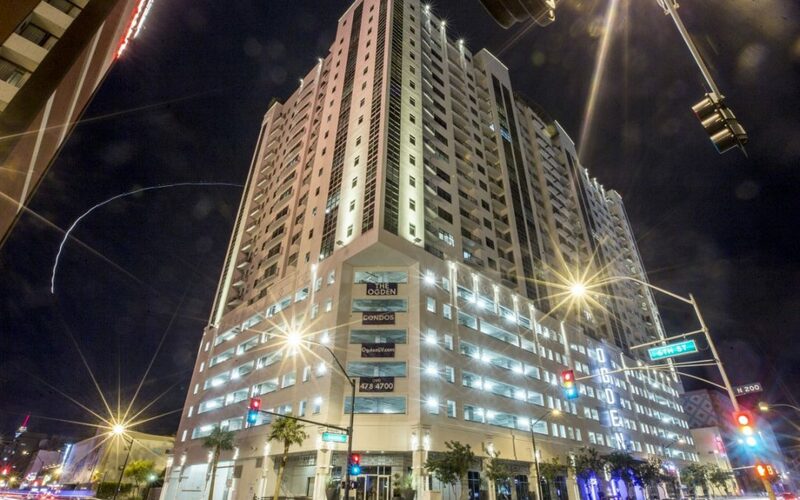 Every high-rise in Vegas is strategically situated to make living easier. A few are right on the Las Vegas Strip. Stepping out of your building will lead you right into some of the world’s best shopping, dining, casinos, and entertainment you could ask for. A few more are in the centrally located to freeways, making the trip to and from work or play effortless. A handfull are in the heart of downtown where there is always something locally oriented going on. From your rooftop pool, gym, or condo you’ll find some of the best views of Las Vegas. You can watch the strip lights dance late into the night, the Bellagio fountain show, see a sunset over the mountains, or take in the cityscape all from the comfort of your home. Want to tour a high-rise and see if you should call it home? Give me a call to view one today!